Maybe you've been reluctant to try grilling salmon, or you've made it before and you're just getting tired of the same old flavor. This recipe includes a unique new flavor twist blending a little Jack Daniels with crushed pineapple and it's juice. And it's a great opportunity to finally try grilling some salmon on a cedar plank, wait until you see just how easy it really is! The flavors of the Mojo salmon marinade (recipe repeated below) just seem to work so well and blend perfectly with the taste of salmon. The pineapple gives a candy-like sweetness while the Jack Daniels gives it just enough edge to balance the flavors. When grilling salmon with this recipe try to use less powerful side dishes like rice and green beans so you don't take away from the amazing flavors of the main dish. 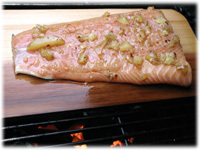 In your sink or a pan of water submerge a cedar plank that will be large enough to completely hold the salmon fillet. 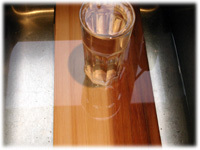 Place a glass of water on top to keep the plank submerged. Soak the plank for 4 hours (while the fish marinates). This helps prevent the wood from completely getting burnt while grilling. 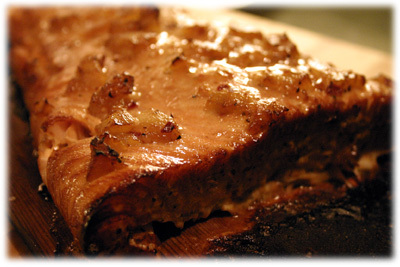 Variation: After you've tried this recipe you could experiment using different woods (like apple) or different soaking liquids (like apple cider). 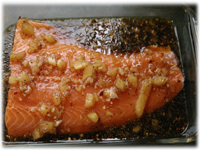 Lay the salmon in a large glass dish pink flesh side up (skin side down). Mix the ingredients for the marinade in a medium sized glass bowl. Pour the marinade over the salmon to completely cover it. Flip the salmon over in the dish so the flesh is down and soaking in the marinade. Cover with plastic wrap and refrigerate at least 4 hours (while the plank soaks). Preheat the grill to 400F and prepare for direct grilling. 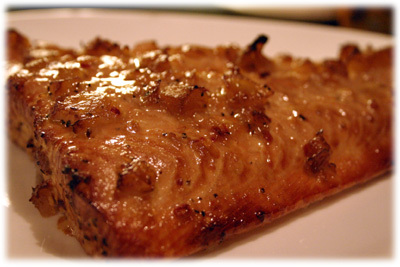 Remove the plank from the liquid and the salmon from the refrigerator. Place the plank on the grill over direct heat and close the lid for several minutes, just long enough to get the plank up to temperature and on the verge of smouldering. Center the salmon flesh side up (skin side down) on the cedar plank and ensure plank is over direct heat. 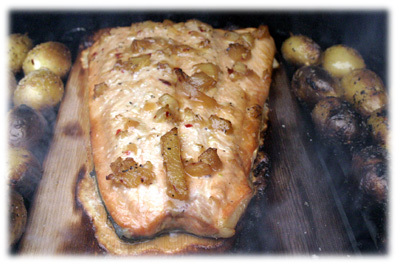 Grilling salmon on a cedar plank takes a little longer than grilling fish normally takes as the wet plank absorbs much of the heat initially. Also, the lower 400F temperature helps prevent the plank from burning entirely before the fish is cooked! After 15 - 20 minutes check on the fish. When the flesh begins to flake easily and is no longer "wet" in the center it's time to remove it from the grill. At 400F this usually takes between 20 and 30 minutes. After removing the salmon from the grill transfer it from the cedar plank to a serving dish. 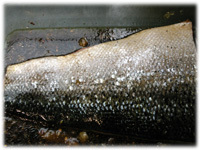 It's usually pretty easy to slip a spatula between the flesh of the salmon and the skin to separate it before serving. A 1 lb salmon fillet like this one usually feeds 2 to 4 people. The way this one tasted I could have eaten it all by myself! This is one of the easiest ways of grilling any type of fish, not just salmon.